I've worn this skirt every day since Friday- I have another outfit to show you next week with this skirt for work. God it feels a million years since my last outfit post. My last outfit post that had recent photos at least! I kind of lost my blogging mojo with the unpredictable weather and just generally being very busy! I'm pretty sure I've been wearing the same outfits for weeks on end for work (there has definitely been a lot of outfit-repeating going on!) and at the weekends I just want to throw something on and enjoy my weekend! But, finally, I seem to have some creativity back! And it's mainly because of this skirt. I've had this skirt for almost a year now, but I tend to only really wear it in the evenings. This, with my Los Pollos Hermanos tshirt and ankle boots, is my favourite casual evening outfit, and that was exactly what I had planned to wear on Friday night. Kris' boyfriend Dave is a comedian and he was doing show in town, so I went down with Phil and the rest of the Frank team (it was ace!). But the problem was I was going straight after work, then staying at Phil's before I headed to Oxford for the weekend, so I didn't want to have to bring a ton of clothes. 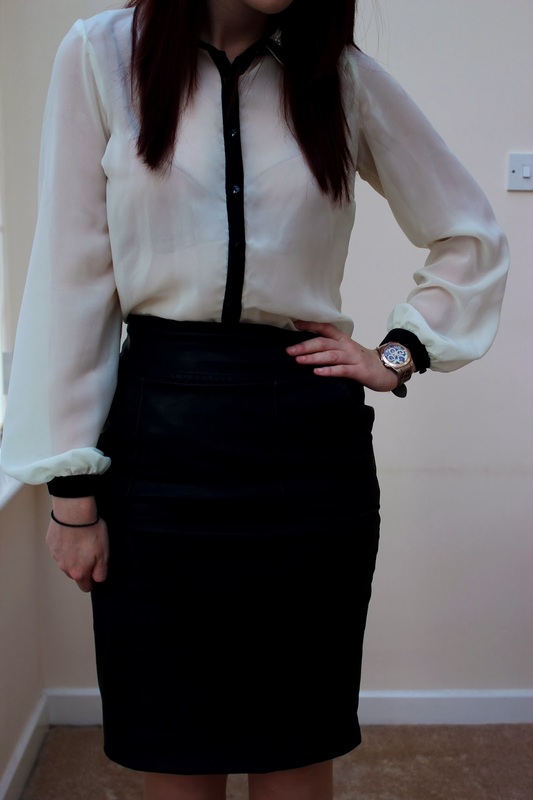 I had an image in my head of this skirt with a silky blouse for work, instead of my usual white shirts (my Mum says they're like school shirts!) 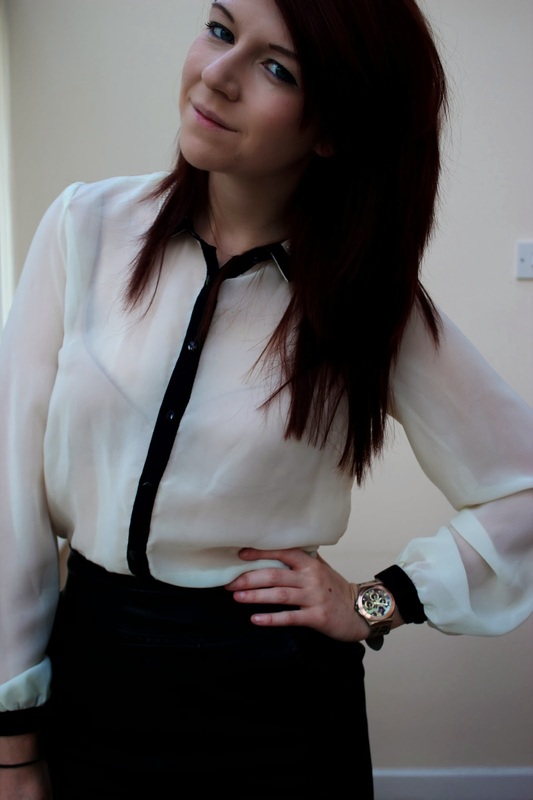 and I'd completely forgotten about this blouse. I bought it from Primark last year but as soon as I went to put it on one of the buttons fell off! My Mum stitched it back ages but I'd pretty much forgotten about it, but she suggested I try it with this skirt. And I love it! I actually didn't wear these boots for work (I wore my normal boring work shoes- despite the fact they are officially falling to pieces!) but changed into them in the evening (have I mentioned Phil is 6'5"?!). This outfit is a little more racy than I normally go for at work (I swear you couldn't see my bra in real life as much as you can see it in these photos! 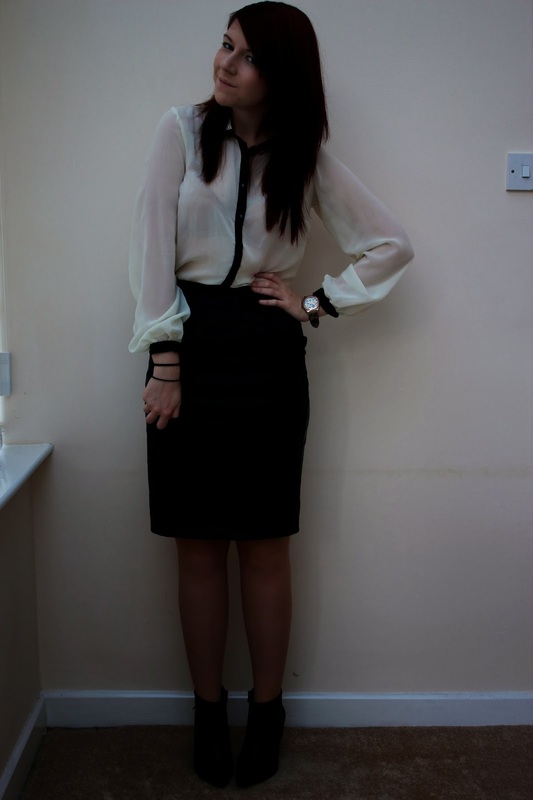 ), but I've started to wear this skirt more and it's helping me to enjoy getting dressed for work again. I've been at Frank for a year this month and the novelty of wearing a pencil skirt every day does wear off after a few months! Anyway, the last few weeks have been mental, and they don't seem to be quietening down. I have something going on now every weekend til Christmas! As I said I went out Friday night and then headed down to Oxford for a weekend with my friend Becca, who has just bought herself a house! On Saturday we had lunch and caught up, and then decided to ruin all the fun by watching The Green Mile. Neither of us had seen it, though I'd read the book, but it wasn't quite fun Saturday night viewing material! On Sunday we got up bright and early and headed into Oxford. I'd never been to Oxford before so we did the proper touristy thing and did the bus tour! We wanted to go have a look at Christchurch and see where they filmed Harry Potter, but as we went to get off the bus we were told it didn't open on a Sunday til 2. Nightmare! Instead we had lunch and wandered around the shops before my super-long journey home (three hours of train time!). I had such a nice, chilled weekend though, it was perfect! And this week is busy too. Despite my love of fireworks, tonight is the only night this week that I'm not doing something so the plan is blogging, making lunch for tomorrow and maybe an episode or two of Lie To Me (it's filling the Breaking-Bad-shaped hole in my life). Last night I had my second charity choir rehearsal. Did I tell you I joined a charity choir? I haven't sung for years and I'm really enjoying it, and it's run by the same people who ran the theatre group I was involved with as a teenager. We're going to be singing in hospitals and old people's homes, so that will be lovely. Tomorrow Steph and I are going to Pizza Express, Thursday I'm giving blood again and Friday Phil and I are going to see Sweeney Todd on stage! I absolutely loved Sweeney Todd when the film came out a few years ago, and I'm listening to the soundtrack to get me in the mood. I'm so excited! Weekend is going to be a quiet one for the most part, but then I have my second 10K race, the Manchester Mo Running Race, on Sunday which is going to be a lot of fun! I can't even tell you how many times I've worn a shirt and in the pictures it looked like it was see through! I'm sure you couldn't see through your shirt in real life. It's not than scandalous either way though. I think you look great in this pencil skirt. I really need some great pencil skirts in my life!